Around here most say that Off road diesel fuel is dirty'er than the on road stuff--in fact the fellow I bought my excavator from also suggested I buy On road fuel. I have been buying the on road fuel ever since---it is bout .20 cents more a gallon---That is not a problem for me--I don't burn that much diesel fuel. Whoever told you that was wrong. Only difference between on-road and off-road diesel is tax and color (which probably accounts for that 20 cents). Pump price of on-road includes tax, off-road is tax-free to approved applicants - and is typically home-delivered in bulk. Dye (usually red) is added to off-road so the police can more easily ticket abusers who are burning tax-free off-road fuel in their non-exempt on-road vehicles. LSD fuel (<500 ppm) will not harm any vehicles. ULSD fuel (<15 ppm) will not harm vehicles manufactured from Jan 2007 onward. Earlier models may suffer rubber shrinkage and subsequent fuel leakage. Solution is to treat fuel with a diesel supplement and to replace leaking rubber components with new parts made of Viton. Throughout North America by now, all diesel is low sulphur (costly but easier on the lungs). The road-tax-free version is identical except for the trace dye added (so tax inspectors examining the fuel system can tell if it was used in a road vehicle). Filtering problems? True in two respects. There was one early isolated case of too much dye added that caused clogging. And the ultimate tax-free diesel, home-made biodiesel, is notorious for filter-clogging. Sulphur does lubricate a little, so if the engine is older than around five years you might want to put in a lubricity additive (unless done so by the refiner). There is zero tax advantage to buying "off-road" diesel, all fuel used 'off-road' is tax free, you just have to file a form with the Goobermint to get the refund if it was bought at a gas station. The only difference is that 'off-road' diesel fuel is not taxed at the point of sale based on it being used for uses other than over the road vehicles. Skip I suspect you will find stations that sell the off road fuel but not many. Look for them in farming areas or watch where contractor are pulling in with their construction equipment (not the trucks). You do want a station that pumps a good bit so it is fresh. Here the price is more like 30 cents and yes they will deliver (here want a min of 100 gallons) but still 30 cents per gallon at the pump is worth it to me when buy even 20 gallons at the time or filling my 150 gallon tank. But I do know of a station that sells alot of 'On Road fuel'---thats where I buy my diesel fuel---as little as I use--not gonna wory bout .20 cents more a gallon. Freshness is not as important in diesel as in gasoline. Auerbach, Freshness might not be but my impression is water is more so in diesel. Fresh to me means less water. Am I wrong? Also don't think gas will develop slim but old diesel can. My understanding in some parts of the world the fuel changes with the seasons (temp) so would think it needs to be mixture for the current temp range. Skip here some distributors have pumps for the public. The two places I know who sell off road, sell a lot. I also understand 20 cents per gallon and 50 or so cents per mile cost to drive. For what it's worth, my unauthoritative understanding is that the diesel dangers you mention are associated not with storage by professonal retailers but by owners. You need a water filter in the fuel system if you stored in metal containers with changing temperatures. And if your storage is prolonged and warm, check the appearance for signs of things growing in it, for which you can treat with a biocide. But about that water: my 3-decade-old Yanmar's fuel filter has a sight-glass to show a water line (which I've never seen in 5000 hrs). It's only a diesel concern? Every aircraft I've flown requires a preflight draining of some avgas from the lowest part of each tank, into a container that lets you see a water line if there. I've never detected water, but obviously it's considered a possibility even with gasoline. Conversely, my new Grasshopper has a similar engine to the Yanmar's. But that new Kubota doesn't even have a sight glass -- so obviously one maker no longer considers it a worry for diesel. Finally, every time I take a two-stroke in for servicing, the guy looks in the tank and says, "There's your problem -- stale gas. You say it's three months old? Yup, that's stale." I don't hear that from the diesel guy. 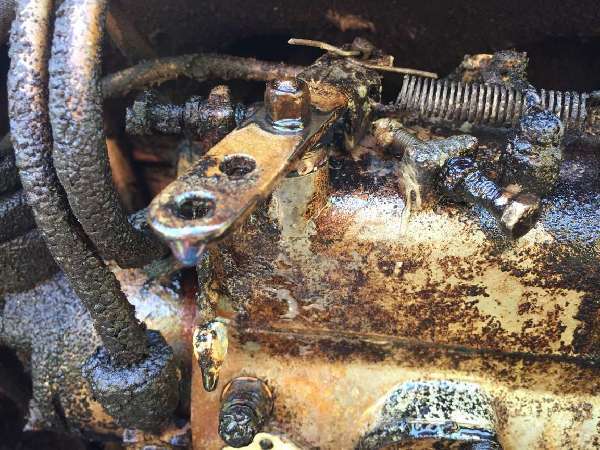 Here is what I know: water had shut down my diesel. Do not think it has done more that cause gas engine to sputter. Now on small gas engine forget that. Those engines seem to not like anything with todays gas. I have bought diesel that had water in it. I agree some issues with diesel happens more likely with the end user.